Every once in a while it's nice to go back to the basics and do something ordinary but wonderful.. smoked brisket. But it's also nice to try something a little new and for this edition, I am going to show you my hybrid method of smoking brisket low and slow to develop that nice smoke ring and give it plenty of time to get that nice and smoky flavor, followed by a high heat finish that will shave hours off of the process. I must admit that I enjoy the long, slow process of cooking a brisket and when time allows, it's one of my favorite ways to spend the day or even the night but, there are times when you need to get a brisket done a little faster than usual and it's more about the task then just enjoying the moments. In this article, I am going to show you how to literally remove hours out of the process without sacraficing quality, tenderness, juiciness or flavor. 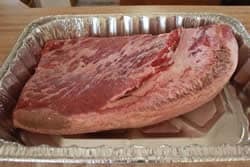 In this article, we are dealing with how to smoke a brisket in less time than it usually takes. Using the low and slow method it normally takes about 1.5 hours per pound for average sized briskets however, I have found that for those times when you need to get it done fast, you can cook it low and slow for a few hours and then finish it on high heat to get it done in record time. In times past, I have always smoked briskets low and slow and I have trimmed the fat cap on the brisket down to about 1/4 inch or so. On this one, I trim the fat from the meat side but I leave the fat cap side as is to help protect the meat from the higher heat it will endure in the cooking process. 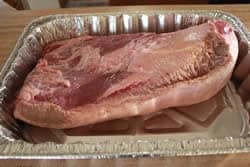 Place the brisket fat cap side down on the cutting board or in a foil pan and use a sharp knife to remove any large areas of fat. You want the meat exposed to the smoke and you also want the rub to be actually touching the meat rather than the fat so take your time and do the best job you can do here. Note: While you are trimming the meat side, take note of the grain direction and if you need to, cut a small corner from the brisket to indicate the cut across the grain. Grain direction will be hard to see once its finished cooking. 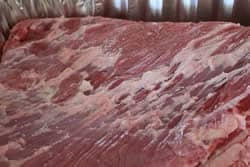 Once you are satisfied with the meat side, mix the 2 TBS of kosher salt and 2 TBS of coarse black pepper together and make sure it is well blended. I like to put this into a cheese shaker since it has large holes but you can use any empty spice container as long as it has fairly large holes. 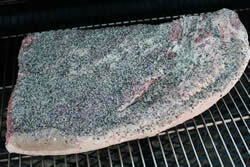 Sprinkle a healty portion of the salt and pepper blend onto the meat side of the brisket. 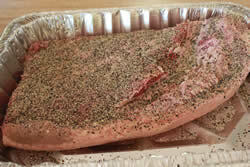 Note: To allow maximum smoke penetration, we are using a light coat of salt and pepper rub at the start and once the brisket is about 2 hours from being finished, we will add on the wonderful flavor of my original rub (purchase recipes here) which will blend in very nicely with the salt and pepper for an amazing finish. At this point, the brisket is ready to go on the smoker. I highly recommend that you get the smoker going first thing and that way it is ready to go by the time you get the brisket ready. 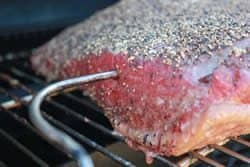 I opted to use the Meadow Creek TS120P Wood Smoker for this endeavor but you can use any smoker for this by simply using the same temperature settings and applying plenty of smoke. Follow the steps necessary for your smoker to bring it up to about 240°f which is where we will hold it for about the first 3 hours. Once the smoker is ready and chugging along at 240°f, it is time to go get the brisket. All of these recipes are easy to do in ANY smoker. Here's some information that I have written on various smokers. Place the brisket directly on the grate and let it smoke cook until it reaches about 160°F. You are probably looking at about 3 hours. At about the 2 hour mark, I insert a digital probe meat thermometer into the brisket so I will know when it has reached temperature. 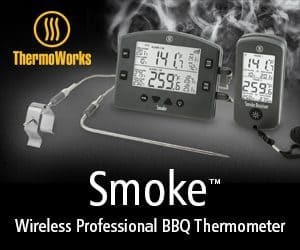 I use the “Smoke” by Thermoworks which is a dual probe remote thermometer with the sending unit at the smoker and the reciever in my pocket. This way, I can go about what I need to do and I always know the temperature of my smoker and the meat. Once the brisket reaches about 155-160°F, you will want to get the pan ready to hold the brisket. Place an entire 15-oz bottle of Worcestershire, 1 cup of apple juice and 4 Tablespoons of Jeff's original rub (purchase recipes here) into the large foil pan. Place the brisket down into the pan with the liquid, fat cap side down. 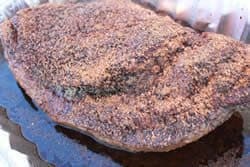 Sprinkle my original rub (purchase recipes here) all over the top and sides of the brisket.. be generous with it. Cover the pan with foil to hold in all that goodness. At this point, you will want to ramp the heat up on the smoker to about 325-350°F. I was easily able to do this in the Meadow Creek TS120P but your smoker, depending on what you have and how cold it is outside, may not be able to cook this hot. Note: It is not a disgrace to use the home oven or even the grill if you need to in order to reach the high temperatures required to get this brisket done in record time. Remember that THIS particular brisket is about learning how to get it done quick. It's not about sticking to what you have always done or even about staying with the tradition of low and slow. Do what you have to do to get the brisket into 325-350 degree heat. Within 2 hours, my 10 lb brisket was reading 195°F in the center of the flat. If your brisket is larger, it may take slightly longer. Once the brisket reached 195°F, I checked it for tenderness by inserting a toothpick into the meat and found that it was not as tender as I liked so I left it in the smoker but I let the heat die down a little to about 250°F. I checked it every 30 minutes or so and at the end of 2 additional hours it was finally as tender as I liked. At this point, you can let it rest for 30 minutes and then serve it immediately. Fill in remaining space with towels, pillows, blankets, etc. The brisket will stay hot for several hours and will continue to tenderize while it waits. Slice the brisket across the grain into about 1/4 inch pieces. Serve with some of my original barbecue sauce (purchase recipes here) on the side for the folks who want it. This 10 lb brisket took 7 hours to finish which is less than 45 minutes per pound total. This just goes to prove that you can definitely do brisket in a hurry when the need arises. Will I start doing all of my briskets using this method? I thoroughly enjoy the low and slow, laid back smoking process but it does give me options if I need them. Hi Jeff, love the site and use it all the time. 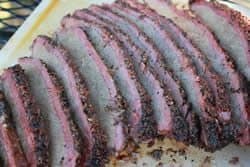 For this recipe, when you check tenderness in the last 2 hours, do you recover the brisket after each check or leave it uncovered? PS the rubs and sauce are amazing! Ben, In this recipe, I usually pull back the foil to check it then re-cover it until I am ready to check it again however, it would be perfectly acceptable to leave it uncovered at this point if you wanted to. Glad to hear you are enjoying the rubs and barbecue sauce! I truly enjoy your book …. Started out with an R2D2 like you. One question tho – how come you never mentioned CookShack electric smokers? When I was looking into electric smokers I found them on line – AND they are located right here in the great state of Oklahoma …. Ponca City. Excellent ratings and I love mine. we live in Stillwater but I come to Sapulpa to give sled dog talks at Freedom Elementary! Why is it so difficult ( for me) to print out one of your "lessons' like the current issue re brisket? There is a "Print" button just below the page content and above the comments area that will allow you to fashion a page to your liking for printing or saving as a PDF.